Few years back a website with audio player handling was considered as a crucial problem but now almost every business can benefit from displaying audio player on their website. And the ones that aren’t keeping up have a lot to lose. One of the major advantages of streaming is that the audience can enjoy some of their favorite music on-line broadcasts without worrying about the storage space on their devices. Thus, more and more young people are trending towards this convenience. In the following post, you will come across a few best HTML5 audio players plugins that might be helpful for your work. Media element is an audio/ video player written in pure HTML5 and CSS. Older browsers supported by custom flash and Silverlight players mimic the HTML5 Media Element API. The audio player is skinnable and offers a wide range of plugins for some of the most popular platforms such as WordPress, Drupal, Joomla, etc. It supports both audio and video. It is capable of playing media from local and third-party sources such as SoundCloud, YouTube, Dailymotion and twitch. The reason why this player, in particular, is given the top spot is that it’s still under active development which means issues will be resolved at a faster pace and the player is more likely to be kept updated with the latest HTML5 standards. Documentation will be top notch allowing the developers to configure right according to the needs. For example, Last.fm and BeatsMusic. On and all, SoundManager 2 is well designed and compatible with the latest browser such as IE6, Safari, and Android. Jplayer is an audio player which is combined with HTML and CSS. Now if you are looking for a jPlayer version that has no dependency on jQuery then React-jPlayer is something worth considering. Heavily inspired by jPlayer, React-jPlayer supports both audio and video as well as all the modern browsers from IE9 and all modern mobile platforms. The project started a few months ago has already reached at the count of 520 downloads in the previous month. Till now, all features appear to be working correctly on both desktop and mobile devices. The trending HTML5 audio player brings a remarkable number of options to users. It supports a wide range of features like a full-screen slide show, allowing pop-up windows to continue browsing without interrupting the audio stream. 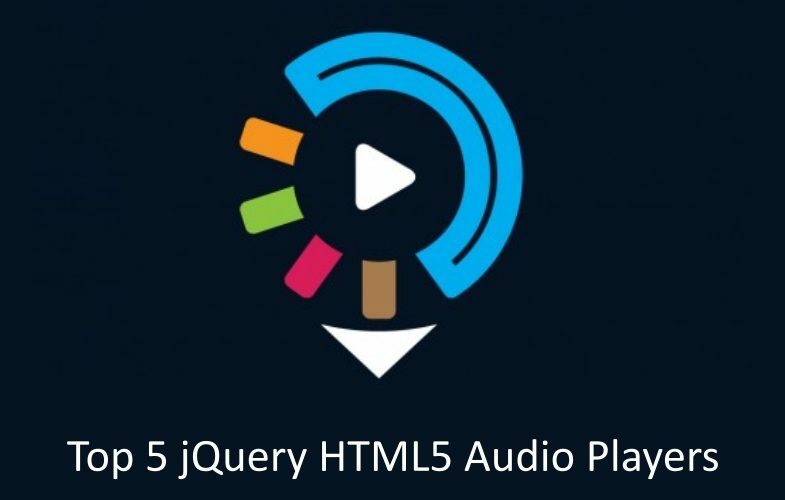 HTML5 Audio Player Bookmarklet is also used by numerous jQuery development companies in India where the bookmarklet adds an audio player to play linked audio files on any page. The Bookmarklet can be used on any page which has links to downloadable audio files. A great tool to stream instead of downloading! Most of the jQuery developers in India choose this audio and video player for the clients who would love to entertain their on-line visitors with a stylish audio player. The player being responsive supports all modern browsers and mobile platforms. It has an extensive API that supports YouTube, SoundCloud, Podcasts, Official.fm, SHOUTcast, and Icecast. Besides, it also supports several other external sources such as Google drive and Amazon S3. The aforementioned list gives some of the finest open source and commercial audio players available in the market. Now when choosing an audio player for a website to make sure that your jQuery development company should be keen on how frequent it gets updated. On and all, commercial HTML5 audio players turns out to be great especially when they comprise of certain targeted features which you need for your website. They are usually available with several skins and ability to customize even further using CSS, open-source source HTML5 audio players by simply adding new code or third-party libraries in order to create a new type of audio player with unique and mind boggling features.